I said this without thinking, and I’m still pondering it today. I hope it came from God, but I’m not sure. I think it’s profound, but maybe it isn’t. Yes, Jesus affirms that great power results when we have faith without doubt. It’s a faith that can actually move mountains (Matthew 21:21). But does anyone have that kind of faith? However, I suspect that to have faith without doubt isn’t a command. Instead it’s something to strive for, a goal to pursue even though we may never reach it. As a result we’re left to contemplate the faith versus doubt problem. The word faith appears hundreds of times in the Bible, most prominently in Psalms (74 times), followed by Romans (40 times) and Hebrews (39 times). In Hebrews we read that “Faith is confidence in what we hope for and assurance about what we do not see” (Hebrews 11:1, NIV). The chapter goes on to talk about the great faith of people in the Old Testament. Nowhere in the whole chapter does the issue of doubt come up. And surely some of these patriarchs did have a tinge of doubt assaulting their faith. Yet they moved forward in faith anyway. I don’t view doubt as a sin, but I do see doubt that keeps us from acting in faith as disobedience. 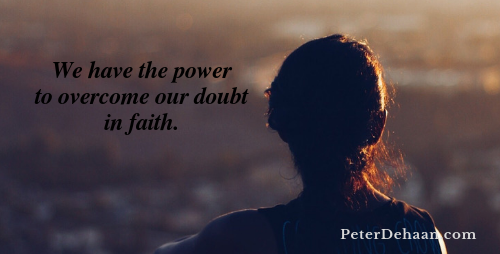 Ideally God would like us to have a faith with no doubt, but I don’t think it particularly bothers him when we struggle in the faith versus doubt department. If our faith wins out over doubt, we’re good. However, we must avoid doubt that squashes faith, causing us to cower in fear instead of acting in boldness. As long as we’re human, I suspect we’ll struggle with faith versus doubt. But if we follow Jesus, we’ll have the power to overcome our doubt through faith.